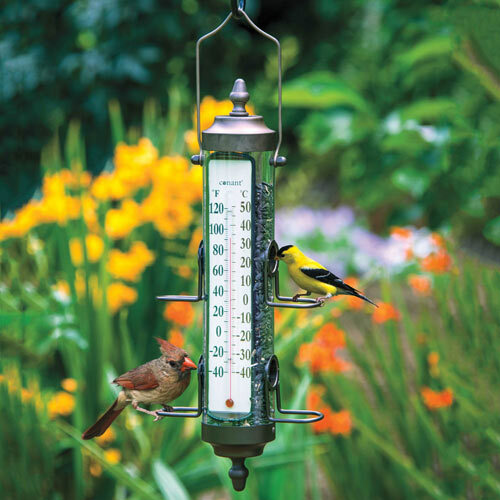 Keep track of birds and temperature! 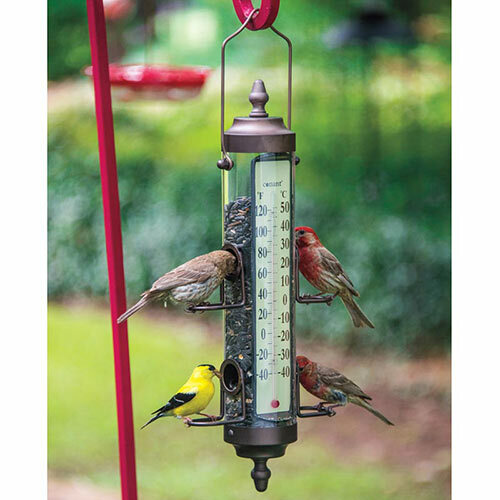 This unique feeder has large perches that even Cardinals can use, 4 feeding ports that accommodate several birds at once, and a clear seed reservoir that lets birds see the food being offered. For weather buffs, the large thermometer is easy to read from a distance, with both Fahrenheit and Celsius scales; an isolated chamber keeps it clean. Secure-fit top makes filling easy, and the quick-release bottom makes cleaning a snap. Made of UV-stabilized polycarbonate that resists yellowing, and anodized aluminum with a bronze patina. Holds 1 lb. of seed. 17-1/2″ H.